Want adorable pictures, important health information, heartwarming stories, and great offers from Petwerks? Sign up to receive our free online newsletter! Approximately once a month, we will send out important information about rabbit health and care, plus funny bunny stories and information about Petwerks products. Our newsletter has been in regular production since 2005, and it's so popular that customers often ASK FOR IT if I'm a few days late putting it out! Now that's love. Check out some of the recent issues! An error has occured fetching recent newsletters. Our apologies. Please try again later. Just give us your name and email, it's that simple! We use a "single opt in" method which means you will immediately be added to our list. You will receive the next newsletter that we send out. We only send about once a month, so you may not hear from us for a bit! If you have difficulties getting on or off the list, just send e-mail to us at info@leithpetwerks.com. Petwerks will not sell or share your name, e-mail address or other personal information to any other individual, company or organization. To be eligible to win the monthly drawing, you must be a member of the list at the time of the drawing. Only one entry per individual. Individuals must not have won in the past six months in order to be eligible to win. 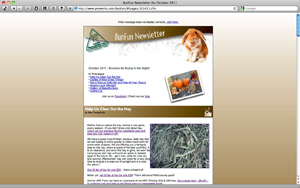 A favorite feature of the newsletter are the pictures of companion rabbits, guinea pigs, ferrets, rats, and other small animals that our friends and customers share with us. Send us your photos and you could win a free treat basket! Sign yourself up, and tell your friends. Then, sit back and wait for rabbit related fun to be delivered right to your e-mail box. After distributing the newsletter through basic means (listserve on our web hosting provider) and then through Mailings, I finally broke down and signed up with a company that could distriute the newsletter and provide me with metrics (how many times it is read, what they click on, etc.). Upon the recommendation of my friend Genia, I chose Mad Mimi. And I've been thrilled. Their services and their customer services are perfect for us. Check them out!